Billing systems create and hand over the bill as a PDF/A document to the regibill-workflow software. The details of the billing party are combined with the encrypted fingerprint of the bill to form the regify-digest and this is embedded into the PDF/A document. The content of the bill remains unchanged. After performing a check of the registration data of the billing party the regibill is registered as a transaction. The regify-clearing-service then saves the anonymised data from the regibill-transaction. TThus creating an audit trail for the bill which which can be validated for the legally required period of 10 years. Sending and receiving of regibills works by using the existing e-mail-address of the recipient. regibill enables the addressee to validate the integrity of a regibill online at anytime during a 10 year period against the registered original bill. The automated check immediately generates a validation report, indicating that the chosen bill and the original bill are congruent. This report is transmitted by e-mail or downloadable. The report also contains the data of the registered invoicing party. Werner Pietruschka Head of Commercial IT. Bills can either be sent electronically or as a paper document, thus giving you choice and allowing you to meet all customer needs. 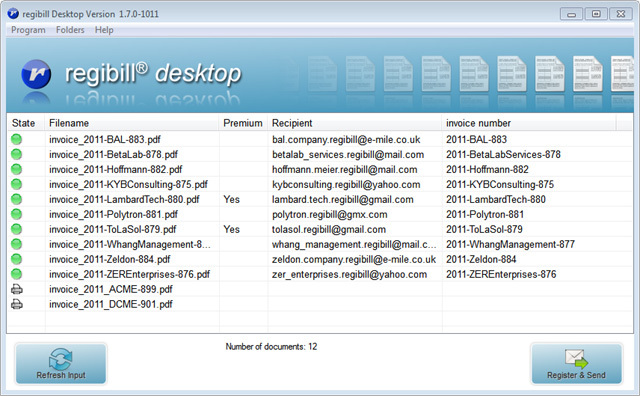 You can have a look at this feature on the below screenshot "regibill desktop“. Automated process in which the regibill desktop prepares the electronic bills (PDF format), and then the regibill user registers and sends them with just one click. Supports dual-channel: electronic and print. Software integration into billing systems of the regibill functionality make the registration and sending process a fully automated one. For a free trial, please contact us in one of our regify offices .